Little work has been undertaken on the Mesozoic (particularly the Jurassic) of Northern Queensland, and consequently much of the tectonic evolution and sedimentary infill of its basins remains poorly understood. Bridging this gap in our current understanding of Eastern Australian geology is of particular economic importance as these basins comprise a significant portion of the epicontinental Great Australian Superbasin (GAS), and the Mesozoic units of the GAS host much of Australia’s groundwater and hydrocarbon resources. My study aims to shed light on the enigmatic tectonic regime of Mesozoic Eastern Australia (the hypothesized "Jurassic Arc") via a multifaceted approach that incorporates regional field mapping, seismic interpretation, core logging, detrital zircon geochronology and basin modelling. The basins which constitute my study area are the Carpentaria, northern Eromanga, and Laura basins of Queensland, in addition to the Papuan basin of southern Papua New Guinea. 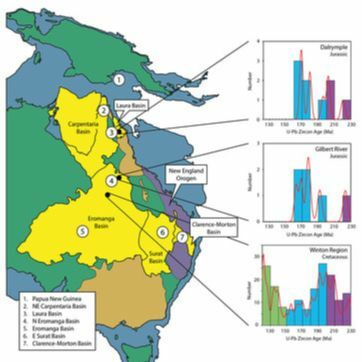 By generating a geodynamic model of Northern Queensland basin evolution, and establishing the provenance, quality and geometries of the sedimentary fill, we can more effectively identify and assess petroleum systems and other resources such as groundwater and mineral sands. In addition, this information will facilitate enhanced exploitation of hydrocarbon assets currently in production. ​2017. Foley, E.K. Hurst, A. Provenance of the Volund, Viper and Kobra sand injectite complexes of the Norwegian North Sea: insights from heavy mineralogy. Conference Talk & Poster Presentation. Sand Injectite Research Group (SIRG). 2017. Foley, E.K. Hurst, A. Constraining the provenance of the Volund, Viper and Kobra sand injectite complexes of the Norwegian North Sea, using heavy mineralogy. Unpublished Masters Thesis. University of Aberdeen, U.K.
2016. Foley, E.K. Reavy, R.J. Geology of the Ardalanish Bay area, Ross of Mull, Argyllshire, U.K. Unpublished Honours Thesis. University College Cork, Ireland.